Causes of Dental Implant Pain - How Long Will It Last? How long will it last, and what's normal? Dental implant pain will normally be one of the first things you will notice after getting an implant, when the numbness wears off. It will feel like you just had a tooth extracted, and there's something stuck in the gum. There will be a sensation of pressure, a definite ache in your jawbone right where the implant is sitting, and the soft gum all around it will be very tender. This is pretty much a reflection of the treatment you've just had. You've just had orthopedic surgery on your jaw! Most patients don't think of it that way, but getting dental implant surgery really is orthopedic surgery on a smaller scale. No matter how much dentists talk about "gently and precisely placing the implant", there's no getting away from the fact that you just had a tooth (or teeth) pulled, a hole drilled into your jawbone, and a piece of surgical-grade titanium (or sometimes ceramic) screwed into the hole. 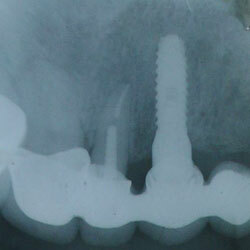 And that's just for a normal, relatively straightforward implant. BUT LET ME BACKTRACK A LITTLE. When patients ask me about dental implant pain, I find that they actually mean only ONE of TWO possibilites; Sometimes they are enquiring about the discomfort that they can expect right AFTER dental implant surgery. BUT sometimes they are actually asking about how painful the actual procedure is, while it's being done. For the vast majority of dental implant patients, the actual procedure is NOT that bad. For a start, your implant surgeon will need to get you VERY numb, and there are a few tricks to help in this regard, such as using a very strong dental local anesthetic. Next, most patients will have some sort of sedation, where they stay awake during the surgery, but they are pretty heavily sedated, either with some tablets, or more usually with intra-venous Midazolam. With intra-venous sedation, you know where you are and you know what's going on, but you really couldn't care! Also, the dentist can "top up" the sedation from time to time during the procedure, if you feel you're coming out of the sedation before the surgery's done. SO, there's actually very little dental implant pain DURING the procedure! BUT DENTAL IMPLANT PAIN AFTER THE PROCEDURE IS MUCH MORE COMMON. Of course it's going to be a bit sore afterwards! Dental implant pain at this early stage is completely normal, and is to be expected. Also, there will also usually be some degree of swelling for 3 to 5 days afterwards. If you have had several implants in your upper jaw, you may even get some bruising around the eyes. 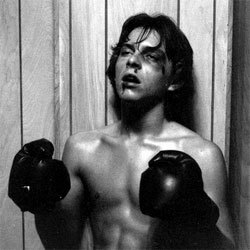 It can look (and feel) like you've just done 5 rounds with Mike Tyson! 5 rounds with Iron Mike! Again, this is all quite normal, and will settle down within a few days. Dental Implant Pain - What can you do to help? During the initial healing phase, which can last up to 7 to 10 days, there are several things you can do to help ease the discomfort. You can help to control any dental implant pain by taking painkillers. One of the most effective is ibuprofen ("Nurofen"), but you have to take 600mg every 8 hours. Your dentist or implant surgeon may prescribe something stronger if he feels you may need it. On the OUTSIDE of your mouth, you can reduce the degree of swelling to your cheek or lip (which can also reduce discomfort) by cooling the area immediately after you get out of the dentists's office. You can do this by holding an icepack on your face over the implant area. Sometimes your dentist will give you an icepack to take with you, which is great. It's in the first hour or two that you want to reduce the inflammation as much as possible. But you have to get the icepack on there as quickly as possible. If your dentist doesn't give you an icepack, the simplest thing is pick up a bag of frozen peas (or something similar) from your nearest grocery store on the way home. Put a thin cotton towel over the skin of the area you are going to put the ice pack on, to prevent the pack from sticking to the skin! The quicker you get that area of your face cooled down, the better! If you want MORE DETAILED information about your dental implant pain, and what you can do about it, I recommend that you download MY OWN 80-page ebook. Just CLICK HERE to read ALL about The Toothache Survival Guide. With the icepack, be careful not to give yourself frostbite! You don't want to freeze your face - just cool the area adjacent to where you got the implant. A good trick is to use a very thin cotton towel on the skin under the icepack. This will stop the skin surface from freezing to the icepack! It's very important NOT to swish the water around your mouth forcefully. DO NOT SWISH! Just take a sip of the hot salt water, and gently tilt your head to allow the water to bathe the gum where you got the implant. Hold it there for 10 - 20 seconds, spit out, and do it again a couple of times. Go extremely gently with this. You shouldn't spend more than 2 minutes doing this, but you SHOULD do it every 2 hours or so for the first day after surgery. After that you can stop. HOWEVER, the very best thing you can do is apply a high-quality aloe vera gel directly to the gum with your fingertip. The best aloe gel available (with scientific research to back it up) is from Forever Living. Read more about this (and order directly online) HERE. You can also help reduce any dental implant pain by taking it easy and putting your feet up for a few days! Don't do any strenuous chores around the house, don't go to the gym, don't do anything that takes any effort! Just chill out with your feet up, and give your body a chance to start the healing process. Finally, think about what you're going to eat. For the first day, something cold and soft is ideal, like ice-cream, fruit yoghurts, or similar. No potato chips or crusty pizzas! Dental Implant Pain - How much will it hurt? The main factor is how complicated the surgery was. If you had to get bone grafting or other additional surgery, then you can expect a bit more dental implant pain afterwards. This is also quite normal. It's just like the discomfort you would have after any surgery. Taking the measures I described above is usually enough to keep things comfortable. Getting a dental implant without any additional surgery (such as bone grafting or sinus surgery) usually involves about the same level of discomfort as getting a tooth pulled. More or less. Have a look at getting a tooth pulled. To re-cap, pretty much all swelling should be gone in 3 to 5 days, and 99% of dental implant pain should be gone in 7 to 10 days. BUT HERE IS AN INTERESTING SURGICAL FACT. For some reason, it is quite common for the initial discomfort to wear off over 2 to 3 days, and then on the 4th and 5th days to feel MORE pain. It's like it was getting better, and everything seems to be settling down, and then BAM! the pain seems to be getting worse again! Don't panic. It doesn't necessarily mean that anything's wrong. This is something that happens a lot (but not all the time). The important thing to watch for is ANY SWELLING COMING BACK. If you feel that there is any swelling coming up again, call your dentist or implant surgeon right away. This could be an infection that needs antibiotics as quickly as possible. But if there's NO swelling coming up, just a feeling of more dental implant pain than the day before, it's likely to be this surgical phenomenon that we sometimes see around 4 to 5 days after surgery. It's not just dental implants. This seems to happen with ALL types of surgery. Another important factor in how much dental implant pain you experience is how you tend to heal. Some people seem to heal much more quickly than others. They tend to have little pain or swelling. For these lucky people, implant treatment is frequently very straightforward! A week to 10 days after you get the dental implant, pain from the procedure should be pretty much settled. If you are still having significant pain, then there may be some problems. 1. A loose healing cap. 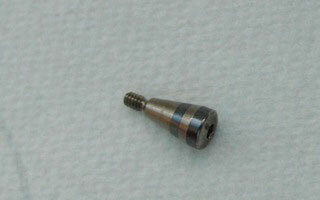 A healing cap is a small screw that fits in to the top of the implant while the gum is healing. 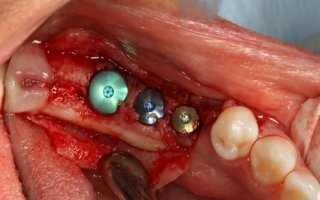 It is removed later on when the crown is fitted to the implant. During the healing process, it is possible for the healing cap to work loose. This can irritate the gum and make it sore. Your dentist will remove the loose cap, clean inside the implant, and fit a NEW, STERILE healing cap with a smear of anti-bacterial gel, such a Chlorhexidine gel. The image above shows three healing caps in place, fitted into 3 implants. A loose implant. In some cases, the implant itself can work loose. There are several possible reasons for this to happen, but the important thing is that it can become painful. Occasionally, given enough time, the implant may heal into the bone, and settle down. Usually, however, a loose implant must be removed. You can read more about this at dental implant failures. Infection. This can be an infection of the soft gum around the top of the implant, or a deeper infection in the bone surrounding the implant. Once possible causes such as a loose healing cap or a loose implant have been ruled out, a course of antibiotics is the next step. Read more about this at the dental implant infection page. For gum infections, such as around a dental implant, a high-quality peroxide-containing mouthwash can be very effective, because it releases OXYGEN. The BEST one is the TheraBreath Oral Rinse, available from Amazon. 4. Temporary bridge pressing on the gum. Frequently, patients want to have some sort of temporary tooth in the gap while the implant is healing. This can cause what feels like dental implant pain if it puts much pressure on the gum over the implant. 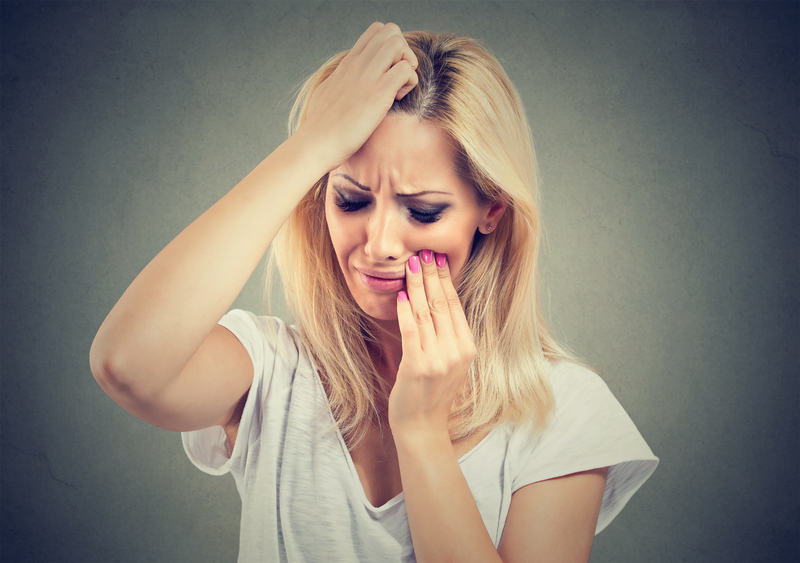 This problem does not usually occur with a "fixed" temporary tooth, such as a Maryland bridge, but it does happen quite frequently if you have a dental flipper tooth replacement. Just leave the flipper out until your dentist can adjust it. 5. "Bone burn". Very rarely, the bone around the implant can be damaged by heat from the drill during the implant surgery. This bone will not heal. It is dead bone. It can be extremely painful. The only answer is to remove the implant and the layer of dead bone, and allow the area to heal up, usually with bone grafting to fill up the space left behind. This will need to be done by a specialist oral surgeon, so if you got the original implant done at your general dentist's office, he will probably have to refer you to an oral surgeon. This problem is very rare. As you can see, dental implant pain in the first few days after surgery is pretty normal. After 7 to 10 days, if you are still having significant pain, you should go back to your implant dentist to get it checked. Remember, days 4 and 5 MAY be the worst, but there should be NO SWELLING by that time! Here's a brief paragraph about dental implant pain at WebMD.